Drugstore.com might be the worst-kept secret on the Internet, as they consistently have great deals. Right now save up to 60% on a variety of items storewide. I post this every once in a while, usually after I shop there and realize the deals I'm getting. So guess where I just came from? What about shipping, you ask? Just spend $25 or more and it's FREE. 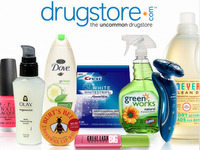 Click here to view all the offers at Drugstore.com.